Pay no attention to the sleepy editor behind this book. I stayed up too late last night, and I have only myself to blame. Or maybe, instead of blaming myself, I should blame a book. I had to read a book for my book club that meets this Friday. You see, I have been reading the books in the series A Game of Thrones, and I just finished the fifth installment. (I keep thinking the next book in the series will have only blank pages because George R. R. Martin will have killed off all the characters.) So I was a bit depressed about being done with the available A Game of Thrones options and unenthused about reading the book club choice, Hotel on the Corner of Bitter and Sweet by Jamie Ford. It sounded a little too sentimental and gooey to me—not a beheading, a giant, or a good battle to be seen anywhere. Despite all that, I got totally hooked on the book. So I ended up standing next to my bed at 12:30 this morning trying to put down my Kindle so I could go to sleep. That’s why I’m grainy-eyed and begging for caffeine. There’s nothing quite as pleasing as getting sucked into a good book, even if it does mess up my sleep schedule. I know your little ones feel the same way when you read a book to them! 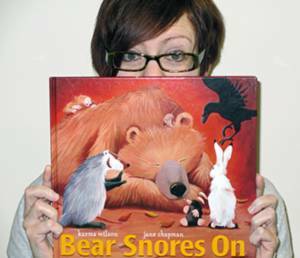 So take a gander at this adorable idea for one of my favorite picture books, Bear Snores On by Karma Wilson. I’ll present it to you in 1.11 minutes, because I know you’re busy! P.S. What are you currently reading-both to your youngsters and for personal enjoyment? We will be reading Bear loses a tooth and bear feels sick this week for our health/dental week. Love the bear books!!! Love doing the different voices and how the kids can “read along”. I just finished reading Stella Bain by Anita Shreve – loved it read it in a days time. So last night I started The House on Tradd Street by Karen White (I think). I too read the GOT books but this last one lost me — couldn’t even make it to the end and I hear Jon Snow – may or may not be dead – I hear he was stabbed — and not sure if there are enough characters – everyone of my favs is gone – except maybe arya but he took her off in some weird crazy path. I keep hoping somehow the wolves will bring them back — I like Bran too but the last two books not much has really happened. I haven’t read Bear Loses a Tooth! I’ll have to check that out. The House on Tradd Street looks like something I would enjoy. I love a good romance novel with a supernatural element to it. I’ll have to download that one after I finish blowing through Hotel on the Corner of Bitter and Sweet. I’ll stick with the GOT books unless he kills Tyrion. If Tyrion meets a sad end I may have to throw the book across the room! My kiddos adore Pete the Cat so for fun we are reading Pete the Cat and his Magical Sunglasses right now. I am always doing the same thing Kim staying up way to late reading. Right now I am reading The Returned. But I love James Patterson books. I am currently re-reading a book that has impacted my professional career. The book is entitled “Teaching With Love and Logic”. This book is so practical, yet offers a method of working with students and bringing about change in your classroom that is phenomenal. It’s a “MUST READ” for educators. I am a huge fan of Robin Cook novels. I have stayed awake late into the night many times to finish reading some of his books. We just completed a food unit in my classroom, and my students cannot get enough of “Stop that Pickle!” They want me to read it over and over and over. It reminds them of “The Gingerbread Man,” another favorite of theirs.